If you need a place to take your kids on a rainy day, arcades in New York are the perfect solution. 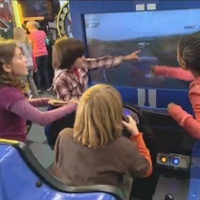 You will find video games of all sorts and for all ages at arcades in NY. 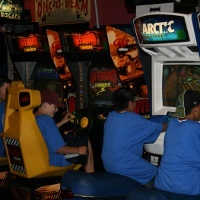 Kids can spend hours playing at NY arcades, winning prizes, getting high scores and having a blast. Looking for a great boardwalk-style arcade? Look no further. The City of iPlay America is not your average arcade or amusement park. From the second you walk into iPlay America's one-of-a-kind, massive arcade space, you enter a world of extraordinary fun like nowhere else! The Boardwalk Arcade features more than 250 classic arcade and exciting new video games, redemption games and the largest number of crane games in New Jersey. Whether you’re bidding on Deal or No Deal, racing the latest Ferrari on-screen or Ghostbusting, the arcade is as fun for adults as it is for kids. Accumulate iTickets on your Game Card and redeem them for awesome prizes immediately or save them for next time for something really big. In the City of iPlay America, your iTickets NEVER EXPIRE! Check out all the thrilling attractions like Cosmic Battle 2-Level Laser Tag, 4D Theater, indoor Go Karts on the Pine Belt Speedway, Bumper Cars, Skyscraper, Boardwalk, Mini Bowling, the Freedom Rider spinning coaster and the largest indoor high-ropes course in New Jersey! Plus, there’s a variety of other rides and attractions just for younger children like Jump Around, Dizzy Dragons spinning ride and the thrilling Happy Swing! 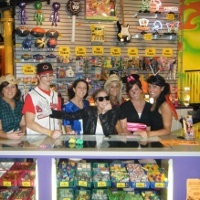 iPlay America also has terrific concerts for all ages, celebrity Meet & Greets and amazing events. iPlay America won the 2016 Trip Advisor Certificate of Excellence, and the Asbury Park Press Best of Monmouth County honors for Best Indoor Theme Park and Best Candy Store. iPlay America also features an outstanding selection of food options. There is something to please every appetite at Game Time Bar & Grill, Sonny's Boardwalk Grill, Boardwalk Bites, The Grind Coffee Co. and Broadway Sweets, one of the region’s largest candy stores. And best of all, it's ALWAYS FREE to enter! From birthday parties to congrats for good grades to a spontaneous night out, iPlay America is Central Jersey's best place to go out and GET INSIDE THE FUN! Because no matter what the weather is like outside, iPlay America is COOL when it’s HOT and HOT when it’s COOL! It’s YOUR Ultimate Everyday Getaway! Chinatown Fair is world famous for being home to the Tic Tac Toe playing chicken, who was talked about enthusiastically by Al Pacino in the movie The Devil's Advocate. Bring the family 365 days a year to visit the famous chicken and stay for the afternoon to play any of their video games, which range from rhythm and dancing to ticket and novelty, fighting, driving and shooting. Their range of video games offers something for everyone in your family! Many games reward you with tickets, which can be exchanged for great prizes at the redemption center. Chinatown Fair is also one of the most affordable places to host a birthday party in New York City! Party packages start as low as $13.99 per child, which includes a private 2 hour time slot, $25 in game play, a slice of pizza with soda and more! Call 551-697-5549 to discuss your party needs with their party specialist or bring the family down for open arcade play during normal business hours. Visit their second location in Passaic County, New Jersey! Take your kids to this fun arcade and entertainment center for a special evening out or an afternoon of fun. Chuck E. Cheese's is filled with places to run, jump and play and games and rides for all. Little kids can play in the toddler area which has been designed specially for young minds, while older kids will have a blast in the arcade area. One of the best parts of Chuck E. Cheese's is that you can eat dinner there too, so kids can take a break from fun for some pizza and then head right back into the fun zone to win some cool prizes. For years the arcade on Brooklyn's Coney Island has delighted visitors of all ages. 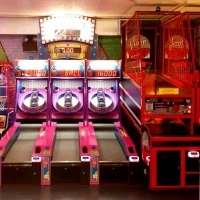 When you visit this fun arcade you can play games such as Skee Ball and Pokereno - both Coney Island originals, as well as a wide range of other entertaining games. Try out newer games such as The Boxer where you can test your punching prowess, or The Soccer Club where kicking is the name of the game. 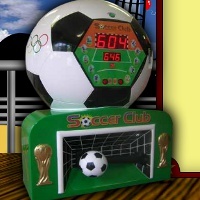 Fun instant redemption and ticket dispensing games make the challenge even more enjoyable as kids try to win prizes! Among NY arcades this one truly stands out as a New York icon. This fun NY arcade has games of all sorts - from sports arcade games to crane machines, they have it all. Play Deal or No Deal, Tokyo Drift, In the Groove and many more popular games. You and your kids will have a blast winning prizes and racking up high scores when you spend an afternoon at this arcade. This game room is located within a bowling alley so you can have a whole day of fun when you buy a bowling package. 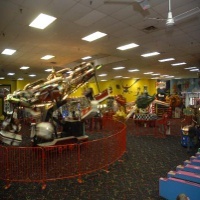 This is also a great place to have a birthday party, between the snack bar, game room, prize counter and bowling lanes you will have nonstop fun from start to finish. When you bring your children to this great arcade in New York they'll never want to go home. 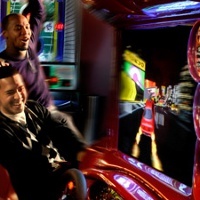 From a huge range of arcade games such as Tokyo Drift, Deal or No Deal, Dance Dance Revolution and more, to indoor carnival rides such as Twister and Bumper Cars you will find something everyone will enjoy. A special toddler area caters to younger visitors while Lazer Runner and a climbing maze keep more active older kids busy for hours of fun. This great arcade is open 7 days a week all year long so you can have fun anytime! 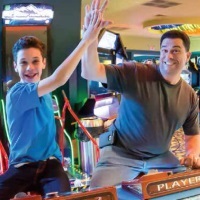 Dave and Buster's is a fun arcade/restaurant combo where the whole family can have a blast. Go for lunch or dinner and some playtime on one of their many arcade games such as Pac Man, Carismo, Dance Dance Revolution and more. Race against friends in Daytona USA or test your trivia knowledge on the Super Trivia game. For the adults Dave and Buster's has a full bar with a daily happy hour. 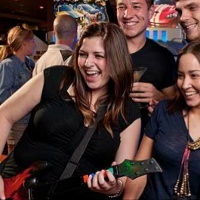 Lunch and dinner at Dave and Buster's are fun with friends or family, especially when you order an "Eat & Play Combo" which includes game time. When you bring your family for playtime at Funtopia USA they'll have non-stop fun from start to finish. Kids of all ages will enjoy the huge variety of arcade games, sports games, and crane games where they can win tickets and make high scores. A fun redemption center makes winning even more fun as kids will get larger prizes the more they play. 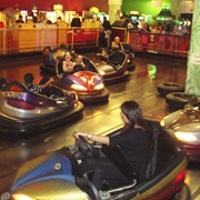 Bumper Cars, kiddie rides, Laser Runner, bowling and a 3 level playground are also available so kids can get their energy out no matter what type of play they enjoy. Funtopia USA is also a great place to have a birthday party! Open 7 days a week. For a day of fun and games visit Adventureland Arcade. 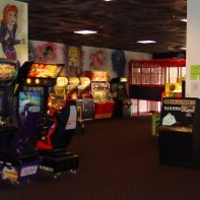 Located in Adventureland amusement park this game center has something for the whole family. Whether you enjoy redemption games where you can get prizes for tickets or you enjoy competing against friends you'll find plenty to amuse you at this New York arcade. The arcade is climate controlled so it makes a great way to get out of the hot sun on a warm day. Play Guitar Hero, Wheel of Fortune, Super Bikes or one of the other many games offered. Fun Laser Tag and Arcade Center! Q-Zar is a cool laser tag and arcade center located on Long Island. When you spend an afternoon or evening at this NY arcade you can expect loads of fun arcade games and cool prizes. From racing games to classic video games, dancing games to fighting games Q-Zar has it all! A wide range of prizes are available from the redemption counter - so be sure to play to win! The huge laser tag arena can accommodate up to 40 players, making this a great place to have your next arcade birthday party. This fun sports center and arcade offers over 40 games of various types from Pac Man to Air Hockey there are games for every type of gamer. Your kids can go with friends and play Street Fighter or Marvel Vs. Capcom against one another for hours of fun. A great place to get out of the summer heat or the rain in spring, this arcade is great fun for boys and girls alike. Batting cages, pitching tunnels, a basketball court and a kiddie play area make up the rest of the sports center. This themed arcade in New York offers a unique gaming experience. With games separated into rooms themed after areas of New York, kids and adults will have fun exploring all their options. Visit "Greenwich Village" where you'll find the pinball machines, go to "Coney Island" and play classic games such as Striker and Big Mouth then head over to the Stadium where you'll find all the sports related arcade games. Hours of fun await you and your children at this great NY arcade. When planning your child's next birthday party be sure to check out Broadway City's party packages! A Whole Land of Fun! 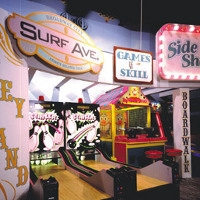 Fun and games await you at Adventure Landing, a New York arcade with plenty of activities and arcade games. 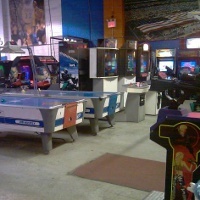 Over 50 arcade and ticket redemption games can be found in the arcade center. Win lots of tickets and redeem them for one of the many cool prizes offered. Race against your friends, shoot enemies or dance your way to victory on these great games. When you need a break from the arcade games, check out the WOW Factory, a 3 story interactive play land or have some fun on the ropes course, a challenging obstacle course suspended 18 feet up! Non-stop Fun at this Entertainment Center! More than just an arcade in New York, Sportime USA is a fun center that includes laser tag, a rock climbing wall, batting cages, an XD theater, rides and much much more! When kids do well at the arcades games they win tickets which they can redeem for cool prizes at the redemption counter. Even adults can have fun at the many types of games available in this great arcade. For a break from all the fun and games, stop by the All Star Grill where they serve fun food such as pizza, chicken fingers, hamburgers and more foods which kids love. Located within a stylish New York bowling alley, this arcade features over 30 games that are fun for both kids and adults. 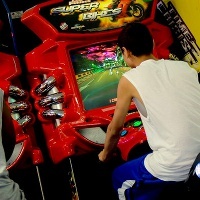 From redemption games like Deal or No Deal and The Giant Crane to musical games such as Guitar Hero and Dance Dance Revolution, this arcade has it all. Use tickets at the redemption counter for cool prizes which include iPods and game systems! Play against the computer or against a friend! The perfect place for a birthday party you can have a bowling and arcade party all in one place when you choose 300 New York!